Our RF Shielded Doors offer the highest protection and feature a damage-free closure seal guaranteed to prevent RFI/EMI leakage. Our doors are constructed from lightweight material and use a cam latch, making them extremely easy to operate. They provide a clear 4 ft. x 7 ft. clear opening with a flush door sill. Our brass extrusion enables the RF sealing fingerstock to be completely concealed preventing accidental damage. All doors are available in a wide variety of natural wood or laminated finishes. USC also offers doors that are equipped with windows to ease patient comfort as well as our fully- glazed door which allows patients to feel more comfortable in the MRI exam room. RF Acoustic Doors are also available for those clients that are concerned with the noise of the MRI penetrating outside of the examination room. USC engineering has designed and developed a door that takes advantage of all of the features described above, but uses acoustical techniques and materials to absorb the noise emanating from the MRI room. The result is an environment where MRI staff and patients enjoy a more quiet environment. Our shielded enclosures offer the very latest in construction and design including RF Windows, RF skylights, and RF Glass Walls enabling patients to be comfortable during the examination. Our RF Shielded windows are designed to meet all MRI attenuation specifications. They are crafted from a double layer of wire cloth with associated glazing, and coated to minimize visual moire patterns. RF Acoustic Windows are also available. USC offers custom penetration panels fabricated from galvanized steel, stainless steel, brass or aluminum. 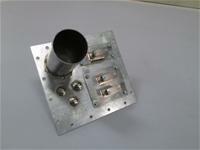 All panels are precision machined and can be custom fitted with the desired connectors, filters, and waveguides. 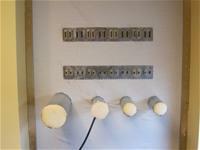 Panels can be designed with blank removable sections for future use. These panels can be used for injectors, MRI, fiber optic, safety related items, or other equipment as required by the customer.